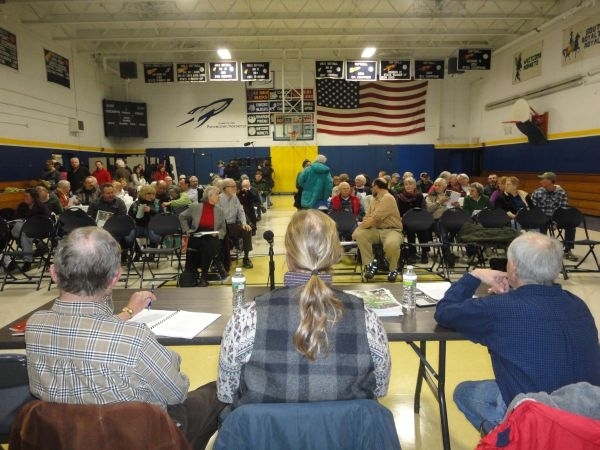 (Host) Unlike most Vermont towns, Rochester has held a number of town meetings since last March. There were daily meetings in the week following the Irene flooding. At last night’s annual town meeting, residents didn’t have to look far for reminders of the storm. (Zind) There wasn’t a mention of Irene on the warning, but the storm and the devastation it visited on Rochester was on everyone’s mind as they gathered for town meeting. (Woman) "Oh those days. Oh those days. God!" (Zind) Even the location was a reminder of Irene. The storm flooded the nearby school auditorium where town meeting is normally held and the repairs aren’t yet complete. So this one was held in the school gymnasium. The meeting began with a show of appreciation – a standing ovation for the town Select Board and the job in did in the days following the storm. (Zind) Rochester residents had a tough decision to make Monday night and it didn’t have anything to do with town business. The high school basketball team had a playoff game in Barre. Some chose the game. About one hundred chose town meeting. Voters moved quickly through the warned articles. Town offices were filled by uncontested candidates elected unanimously. Money items were passed with only an occasional comment, like the suggestion that the money approved for an emergency management fund be used to build an ark. Only a proposal to extend the town clerk and treasurer’s terms from one year to three occasioned a vote by paper ballot. (Zind) The voting provided a convenient 7th inning stretch. A heart shaped box of chocolates made its way around the room as the ballots were counted. (Woman) "Would you like a chocolate?" (Woman) "We could share one." (Zind) The term extension was approved and when business resumed, voters took up a resolution a number of Vermont towns will weigh this year: Whether to support an amendment to the U.S. Constitution that would rescind the Supreme Court decision granting first amendment rights to corporations, known as Citizens United. Two people spoke in favor of the resolution, including Cari Burkhard. (Burkard) "This is wrong. A corporation is not a person. People are people. And that’s it." (Zind) No one spoke against the resolution and it passed overwhelmingly, with just a handful of ‘nays’. The only bad news of the evening: The Rochester High School team lost its playoff game.